KABUL, Afghanistan — American, European and other foreign leaders met here Tuesday to pledge anew their support for Afghanistan, agree to entrust it with more spending decisions, and embrace its president’s commitment for Afghan forces to take charge of security by 2014. 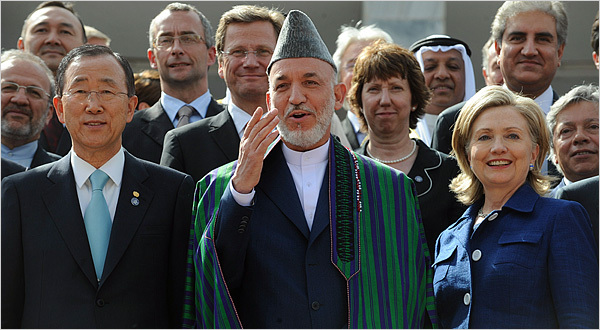 They acknowledged that neither the public in their own countries nor the Afghan people had much patience left. The most concrete commitment was a promise to increase to 50 percent the proportion of international development funds to be disbursed through Afghanistan’s own budgeting process, a change to be made over the next two years and a huge shift from the current situation. Now, many donor countries send money directly to individual ministries or to nongovernmental organizations, undercutting the government’s ability to plan how to use the funds. Critics of the move pointed out that most Afghan ministries had proved unable to spend the money they already got. Whether Afghanistan can get there without an enormous infusion of further foreign aid and the presence of a significant number of foreign troops seems doubtful — at least for the next few years. That point was underscored by the vague language around the timeline for handing over security responsibility. The security transition timetable, though not the main focus of this meeting, was perhaps the most significant element for NATO leaders, most of whom will face election challenges well before 2014. The Western European democracies with the most troops in the country — Britain, France and Germany — are under great domestic pressure to reduce their presence, while the United States, which has by far the heaviest military presence, is hewing to a “conditions based” approach that allows its forces to slow any drawdowns in areas where the insurgency appears more tenacious or where Afghan troops and the police appear to have inadequate capabilities. But for all players, shifting security to Afghan control is the basis of the exit plan. Secretary of State Hillary Rodham Clinton acknowledged the unpopularity of the war in remarks to foreign leaders. But, she said, the Afghans had presented the most detailed plans yet for how to hand off control to Afghan security forces. “Today was a real turning point,” Mrs. Clinton said. The overall significance of the conference was hard to gauge because much of the final communiqué was a list of boards and commissions to be created, laws to be drafted and enforced, and schedules to be fleshed out. The same themes, if not always the exact pledges, have been sounded many times before by Mr. Karzai’s government, to little effect. Mr. Karzai spoke only briefly about the reintegration of the Taliban and reconciliation with them, although it is a major effort of his government and of considerable concern to many Afghans and to foreign troops who are fighting here. The sparse commentary seemed to signal that months of Afghan government consultations, done internally and with foreign allies, had not produced consensus on exactly how to proceed. The criticism of the plan to send more money through the budget process was pointed. The concerns of women were a special focus for Mrs. Clinton, who has made women’s rights, especially in the developing world, a recurring theme. She met with leaders among Afghan women before the conference began to discuss their concerns that the peace effort with the Taliban would lead to renewed disenfranchisement for many women. Arezo Qani, who works with disadvantaged women in northern Afghanistan, expressed fears that rearming local militias, something the United States has pushed, would also threaten women. And she said women should be consulted in the drafting of new laws. Alissa J. Rubin contributed reporting.